As usual I don’t really have an exact recipe but this is a basic guideline. The miso adds depth and umami to this salad (not overpowering at all) and the Kago miso has a beautiful aroma. A surprisingly satisfying vegan dish perfect for warmer days. Plus barley is rich in fiber so this is quite a healthy dish! I was inspired to make this after meeting the president of Kaga Miso, a small miso producer in the Ishikawa Prefecture. This miso in particular is organic (USDA certified) and uses Japanese rice and soy beans. Unlike mass produced miso, their production cycle is still seasonal. He told me that using this organic miso in miso soup is a bit of a waste because it has such a great aroma and you don’t want to lose that in a hot liquid. * To make the preserved myer lemons simply keep them in an air tight container with some kosher salt and myer lemon juice and shake once every few days. 1. Combine the barley and water and bring to a boil. Season to taste and simmer until the barley is fully cooked (add more water if necessary). 2. 2. Set aside to cool. 3. 3. Thin out the miso with lemon juice and add the meyer lemon peel. Whisk in the olive oil to create an emulsion. Season with black pepper. 4. 4. 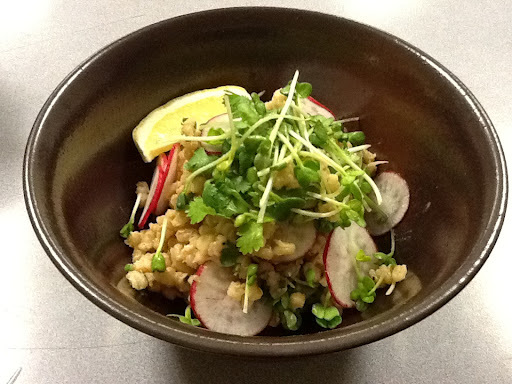 Dress the barley with the vinaigrette and garnish with sliced radishes, radish sprouts, cilantro and a wedge of lemon.